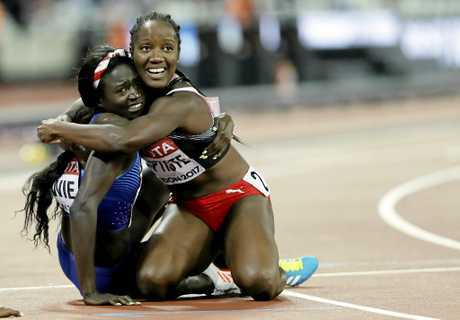 AMERICA has taken back the bragging rights as the world's fastest nation after Torie Bowie produced a spectacular victory in the women's 100m world championships final. Jamaica has had a mortgage on the title thanks mainly to Usain Bolt's dominance in men's sprinting and Shelly-Ann Fraser-Pryce and Elaine Thompson in the women's ranks. But with Justin Gatlin taking down Bolt, change was in the wind and Bowie stepped up with a desperate lunge on the line giving her the title by just .01sec. The 26-year-old, who was the silver medallist at last year's Rio Olympics, clocked 10.85sec to nab the Ivory Coast's Marie-Josee Ta Lou in the last stride with Dafne Schippers third (10.96sec). Reigning Olympic champion Elaine Thompson, who looked brilliant in the semi-finals, followed the lead of her countryman Bolt by having a horrible start. She then appeared to lose stride twice before fading to finish fifth. Having won gold in both the 100m and 200m in Rio, Thompson came to London Stadium as the fastest woman in the world in 2017. Her defeat is arguably even a bigger shock than Bolt's, capping a hugely disappointing two days for Jamaica, the dominant force in sprinting over the past nine years. 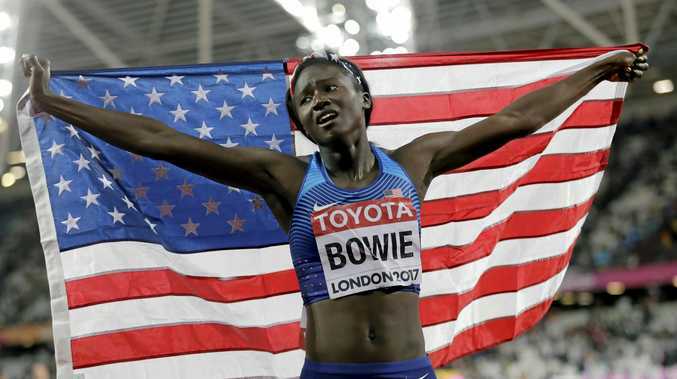 Bowie admitted she was sore after falling to the track as she desperately dipped at the line. "I feel the hard work has finally paid off," she said. "I couldn't be more happy. It hasn't even sunk in. Am I really the world champion?" "The dive doesn't feel too good now. But that has saved me at championships in the past. I never give up until I'm over the line. Thompson, who elected not to back up in the 200m at these world championships, was lost for words about what happened in the final. "I don't know what happened. I just wanted to get a good start but they raced well," she said. "I'll have to watch the video back because I don't know what went wrong."